List of A roads in zone 2 in Great Britain starting south of the River Thames and east of the A3 (roads beginning with 2). A224 road Foots Cray Sevenoaks Previously terminated at a junction with the then A21 at Badgers Mount, south of Orpington; extended to Sevenoaks along the route of the old A21 and A2028. A235 road Purley Thornton Heath Pond In two sections north and south of Croydon town centre, the middle part having formed the main shopping street of Croydon (North End), which is now pedestrianised. A241 Unused Previously a road between Epsom and Banstead (now B284). A263 Unused Previously a road between Pembury and Royal Tunbridge Wells (now A264 and A228). A266 Unused Previously a road between Frant and Hurst Green (now B2099). A270 road Southwick Coldean Formerly part of the A27 before a bypass was constructed around Brighton in the early 1990s. Original alignment went from Sidley Green to Glyne Gap (now B2036). A272 road Heathfield Chilcomb Original westerly end was at Stockbridge. A276 Unused Previously a road from A275 to A26; became part of A275 and old A275 became A2029. A277 road Lewes Lewes Town Road, connecting the A26 and the A27; created after 1997; formerly part of the A27. The original alignment went from Brighton to Portslade-by-Sea (now B2066 and B2194). A279 Unused Previously a road between Handcross and Lower Beeding. Downgraded to a B-class road, the B2110. A282 road Darenth Thurrock Part of the London Orbital (M25). A294 Unused Previously a road between Chichester and Bognor Regis. A297 road Morden Hall Park, Merton Rose Hill Previously continued into Sutton and Belmont to meet the A217. Downgraded to B2230. A2008 Unused Ran along Scanlons Bridge Road in Hythe (now A259). A2012 Reserved Reserved for the Thames Gateway Crossing. The original one ran from A223 (now declassified High Street) to A224 in Orpington (now A232), and after this, ran from Leatherhead to Fetcham (now B2122). A2026 road Thames Road, Dartford Home Gardens, Dartford Previously used for a road in Ewell (now High Street and Kingston Road). A2028 Unused Ran from what is now B2211 (then part of the A21) to Seven Oaks (now A224). A2073 Unused Ran from A27 (now A270) to A23 Brighton (now A270 spur). A2201 road Unused Ran as a road from A200 and A101 in Rotherhithe Tunnel to Surrey Quays (Now B205). A2202 road Unused Ran from A200 in Rotherhithe Tunnel to Surrey Quays as a loop running through a peninsula in Rotherhithe (Now B205). A2207 road Unused Ran along Druid Street, a short connecting road in South London. Decommissioned when it became a one-way pair with the A200. 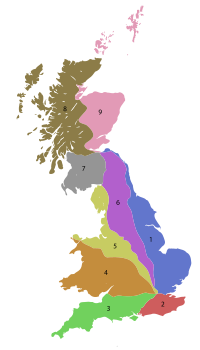 Wikimedia Commons has media related to A roads in Zone 2 of the Great Britain numbering scheme. ^ "A2700 - Roader's Digest: The SABRE Wiki". www.sabre-roads.org.uk. Retrieved 2019-02-22.